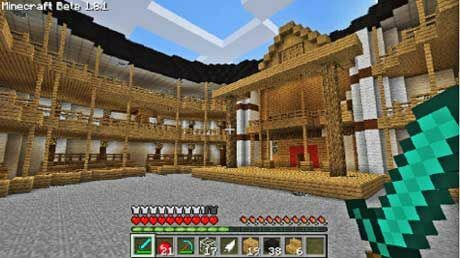 There are many already-created three-dimensional replica structures, like the Roman Colosseum and the Globe Theatre in London, that you can import into the game and have students explore. Many teachers have students create experiences (an update on dioramas) to show their knowledge of historical places and times. Students can also use Minecraft to create stage performances. 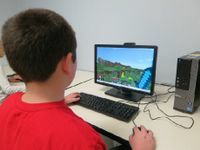 Minecraft is a collaborative game, and students actively work in competitive ways, but they can also work together to solve problems and challenges. I’ve watched many students play together, and I will say that they really want to do well when they play, but they sometimes struggle to communicate with each other in ways that are polite and safe. Teachers can use this as an opportunity to build digital citizenship skills. As students play, teachers should observe and give feedback with checklists and rubrics. Teachers can also facilitate discussions and reflections to support each student in effectively communicating and collaborating. Minecraft can be used to tell stories with characters, locations, choices, motivations, and plots. Teachers can use Minecraft as a tool for students to write and create stories based on their character. Perhaps students might create a backstory for the world they create, as well as for their character. Students can also create a story with different plot elements using the game they play and add more creative elements. One of the best ways to have students display their reading comprehension is to ask them to create a visualization. They can reconstruct various settings from a text, and even re-create scenes and plot events. They can also use these recreations to give a presentation or make predictions on what might happen next, and then actually create those predictions in the game. In addition, many standards we have focus on close reading and critical thinking skills. Readers must make inferences, examine point of view, interpret words, and analyze how a text works. Although games may be light on reading, students must use the same kinds of skills in Minecraft and other games. Games like Minecraft have “domain-specific” words students must know. Students as players must also consider point of view and make inferences based on the world and situations. Teachers should play the game, and reflect on the skills needed to play it, and make connections to transfer these skills when students read complex texts. Minecraft is complex, and students must “read” it carefully and thoughtfully. Like reading standards, math standards call for complex problem solving and critical thinking. Teachers can use Minecraft to build skills needed for math competency. One example is persevering through solving problems. Minecraft requires this, and students can create different challenges for each other. Another skill we seek to develop in students is using appropriate tools in a strategic way, which is exactly what students must do when playing Minecraft. Teachers can examine their math standards for other related skills and use Minecraft to facilitate growth. One of the easiest ways for teachers to use Minecraft in the classroom is as an assessment option. When students have voice and choice, those who enjoy Minecraft can choose it as an option to show what they know. Whether it’s used for a demonstration of knowledge of ratios and proportions or a simulation of a historical event, Minecraft can be another tool to create engagement in the assessment process. As you consider using Minecraft in the classroom, make sure to have specific objectives in mind for implementation. Don’t forget to take time to set norms and expectations. Have students teach each other. Have them teach you if you need help. And if you’re worried about how parents might feel about the game, invite them into the classroom to see the work students are doing. There have been so many great experiments with Minecraft in the classroom, and we can learn from each other how to use the game to better support student learning. How do you already use Minecraft in the classroom? How might you use it in the future in new and innovative ways?